The Angeles RunAbout 4-Passenger Stroller is among the newest strollers from Angeles, so new in fact that you’re not going to find many reviews or comments about it online. 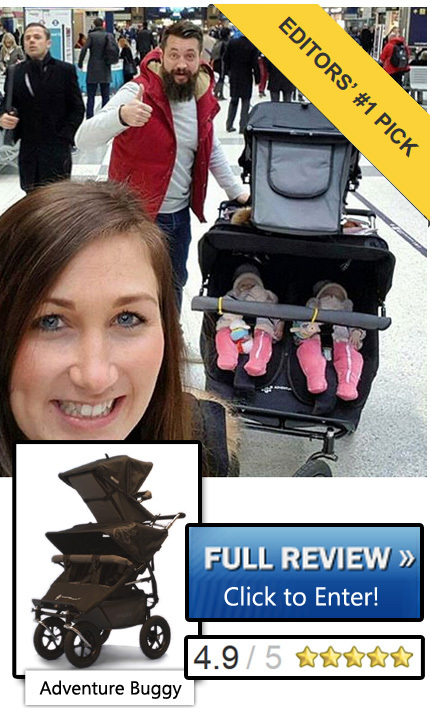 For this review we’re looking solely at the frame and features of the stroller as well as estimations we can make based upon information provided by the company. The Angeles RunAbout 4-Passenger Stroller is a very new product so there’s not much consensus online. Based on the details from the Angeles, we expect it to be a great stroller if you’re pushing kids around the block or going to a necessary trip, but it may be a little large and unwieldy for some chores. Like many of the other Angeles strollers, it’s likely that this product is purchased most for daycare and other childcare centers. If you’re taking everyone for a walk, you’ll be happy to know you’ve got a lot of braking options and a foot-push bar to help you get up curbs. It also features the same support for up to 40 lbs. per seat. That means this is going to be a very heavy stroller once you get anyone in because it’s already over 100 lbs. For the kids themselves, one of the nicest features is the set of very-high headrests. Wandering fingers will have to try very hard to bug anyone in front, so there’s not much chance for fussy times. Coated frame resists rust and scratches. 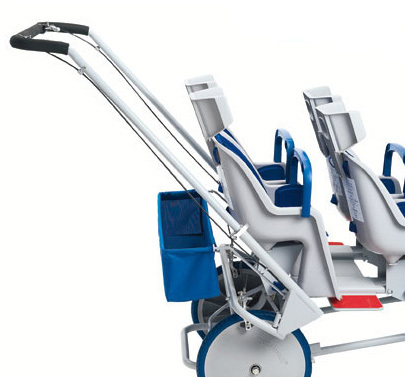 Adjustable molded seats adjust from a 20degree-40degree angle. The seats feature a stadium-styled design so that everyone has a view of outside world. The one problem that occurs with similar setups is that it may be hard to see those in the front seats. To check everyone, you might have to walk around the stroller and take a look. 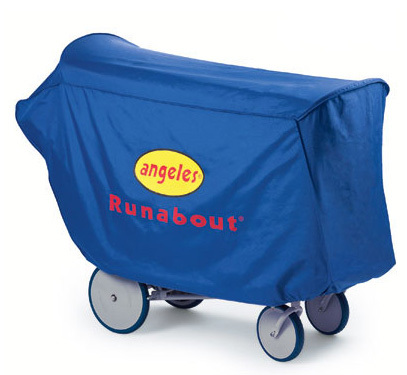 The only accessory listed directly by Angeles is the RunAbout Storage 4-Passenger Cover. The water-resistant cover sells for $119.95 and measures 60″L x 27″W x 34″H (front) and 17″H (rear). That means you’ll only need the single cover for the whole stroller. Another nice thing is that the cover features a one-year limited warranty. Based on reviews of other covers, it should be sturdy and the company is good about replacing any covers that arrive already damaged. 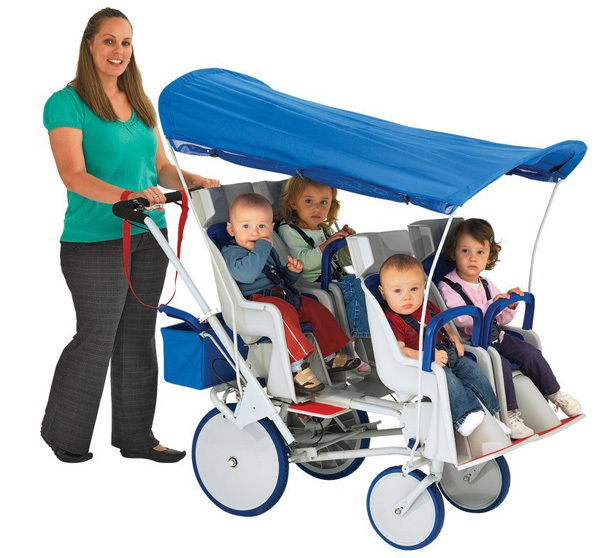 If you own a child care service and need a sturdy walking stroller, this is a good bet for you. It’s not for taking trips in town or the car, but it’s good for stretching your legs. The weight can be an issue if you have to move it up stairs or around narrow areas, but it’s also good because the kids won’t be able to move it around themselves. It’s got great security with commercial-grade brakes and a smart harness system, and a steel reinforced frame that isn’t likely to bend through regular use. Probably not any good for personal use, but it’s best for you when you’re taking care of a lot of kids. The RunAbout line all come with a three-year warranty. 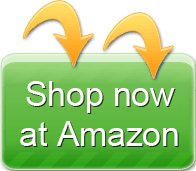 The company says that it honors all sales through its website, catalogs and authorized resellers. It’ll provide a repair or replacement part for free. You can return it during your warranty, but the company has some stricter rules and will charge a 30% restocking fee. No. This is for children 6 months an up and there’s no car seat or infant seat support. Since you’re transporting four kids, it’s best not to have an infant in the mix. Probably not. It’ll fit in large trucks and vans, but it’s unclear if this folds up. You’re likely only going to use this large stroller for walks from your home or business. You’ll need to make sure you can lift it and load it into the van on your own, or have a team to help with the stroller when you take trips. Seats recline to roughly 45 degrees and so it’s comfortable enough for kids to use for a long ride. Similar models wobble if the load is unbalanced. Because of the way weight is distributed in these types of strollers, you should load it front-heavy first. Having weight up front will help keep wheels from wobbling, even if you’re just toting three kiddos. The stroller has a built-in front bar that is high and can help keep older kids stable. For those with younger kids, you may want to put them in back seats since there’s not much room for an infant bar. Angeles founder Claude Tindell founded the company in 1958 when began selling tricycles. Angeles has developed an extensive testing regime for its products to ensure that safety, durability and play value are met. 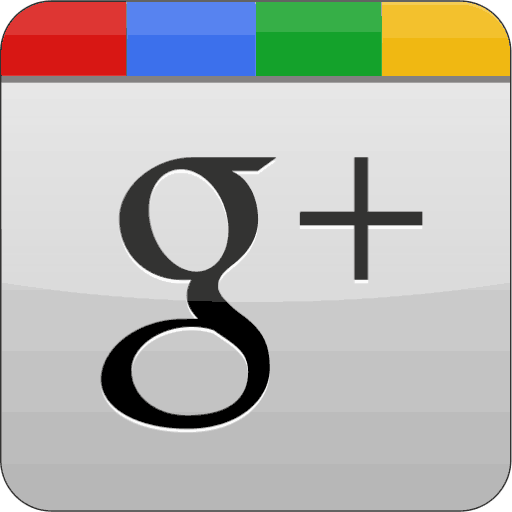 The company operates a large set of sellers and distributors. 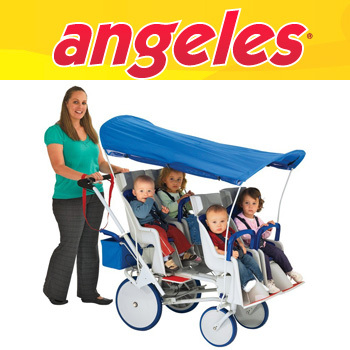 Through this network and its own sales, Angeles says that its Bye-Bye line are the top sellers for multi-seat buggies for daycare and other childcare centers. Good news for you is that replacement parts should likely be available for a long time. The company still will provide replacement parts for its original trikes that are now more than 50 years old. This can be a great stroller for a daycare service and there’s nothing really bad we can say about it in terms of safety, storage or use. The big issue is that it’s heavy. With four kids on the stroller, it’s going to be more than 200 lbs. If you’ve got four kids that are close to the weight limit, you’ll be pushing around more than 300 lbs. Thankfully, it fits through standard doors. If you’ve got a daycare service, this is going to be one of the best strollers for taking a trip around the block. Angeles’s RunAbout version with six seats has extremely positive reviews on almost every site that sells or reviews larger strollers. Based on this information, it looks like a great fit for something you’re keeping at home.